in Detroit / USA, July 4-5 1914. There were all in all 16 cars competing in the 1st Inertnational Cyclecar Race in Detroit: 2 Saginaw, 3 Twombly, Princess, Coey, Detroit, Morgan, Downing, 2 Vixen, Bebe Peugeot, Mercury, Malcolm and Zip. Nothing else is known to us about this race. 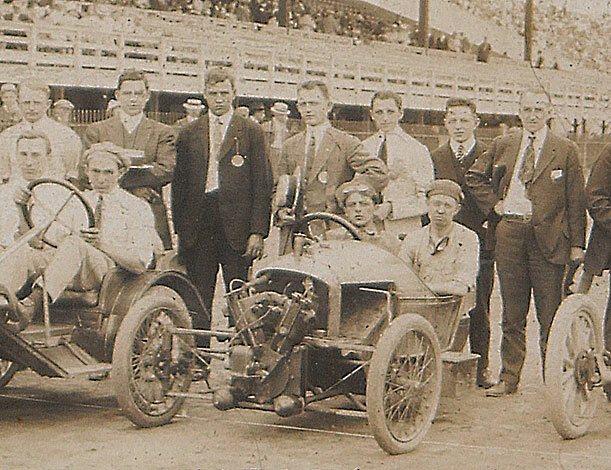 Does anybody have some more information about this Cyclecar race? Who was the winner of that race, who were the drivers, any details? If you can shed some light on that race please forward the information to gk@morgan3w.de and/or trkwells1@bellsouth.net. Cars from left to right: Saginaw, Twombly, Princess and Coey. Cars from left to right: Coey, Detroit, Morgan and Downing. Cars from left to right: Malcolm, Twombly, Twombly, Vixen and Zip.